Sunday night I decided to go all out on a fun welcome home dinner full of favorite foods, and unique creations. I wanted basically a tasting menu, little plates to share and to enjoy. I started with a cheese plate including a nice light Jarlsberg cheese, which is one of my favorites for having a very delicate, yet intriguing flavor. The second was a Blue Stilton which I tend to enjoy better than a straight blue cheese which I feel can be overpowering, and therefore gets boring faster than another cheese that you can really savor. Third was Brie-a necessity in my opinion for a good cheese plate- it is the ultimate in decadence and I adore having it with bread, or crackers. Finally was a great great lightly smoked Gouda that I found that was enhanced with walnuts-this was great! It had wonderful contrasts of both taste and texture. Really tasty. To the plate I added some Merlot cured salami, as well as branches of red and green grapes. Fresh French bread and a variety of crackers laid out, and the cheese course was a perfect way to start the meal. 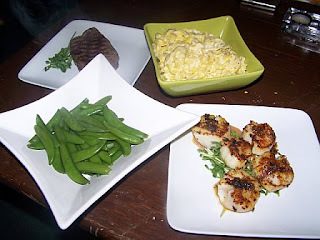 Then I started on the "small plates"- a bowl of fresh Fettuccine Alfredo, a perfectly cooked Fillet Mignon, scallops in an orange sauce, and steamed sugar snap peas. 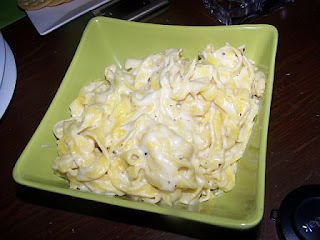 Fettuccine Alfredo is one of those classic comfort foods in my book. Terrible for you, but decadent and delicious- its one of those things I can easily become addicted to. The first time I made it was when I was studying abroad in London, and one of favorite girls was celebrating her 21st birthday. Of course in the UK 21 is not a big year to celebrate, but for us Americans we had to do it right. A good pasta base for the night was a great way to start off. When I made it back then I was shocked at how easy it was to make- and when I made it again this week- the same surprise came right back to me. Alfredo is a simple, almost too simple, sauce to make. I started by making a simple roux of equal parts flour and butter. When the butter had melted completely and the roux was a smooth texture, I began to slowly add cream to the mix to find a good consistency for the sauce. Once I got it to a point midway between thick and thin-perfect for covering pasta- I started to add the cheese. I had gotten a bag of already shredded cheese-which I find easier for melting- of Parmesan, Asiago, Romano and Provolone. I added the cheese by the handful, alternating whisking it to allow it to melt smoothly and adding more cream to maintain consistency. Once I found the perfect blend of both, I added in another handful of freshly grated Parmesan o Reggiano cheese, and then added in just a little nutmeg, pepper and a pinch of salt for flavor variation. The sauce was complete. To continue on the fresh theme, I remade the homemade pasta recipe that I used a few weeks ago. Always delicious- these two together basically created a food rock star- Bono in my opinion. Several weeks ago I made a compound butter of reduced Malbec wine (a decent, inexpensive Argentinian wine that I find perfect for cooking with due to its sweeter taste), shallots and thyme, mixed with butter. 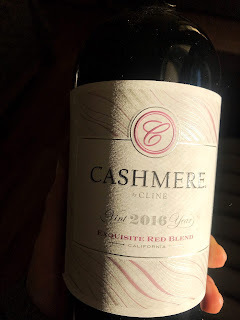 I used this on steak a few times and found it absolutely delicious- though again- rich and decadent. I decided to top a nice piece of Fillet Mignon with this butter to enhance a simply seasoned piece of meat without overpowering it. Here was my fatal flaw though- I had, wrongly, assumed that the butter would last as regular butter would. I was wrong. I excitedly removed it from the fridge ready to dress my steak with it after grilling it to perfection, and sadly found that it had gone bad. 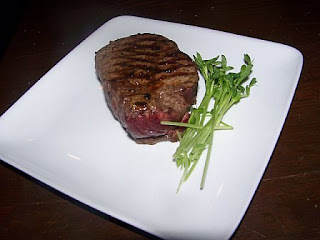 On the plus side- Fillet Mignon is so beautiful that it doesn't need much dressing, but it did look a little lonely on the plate waiting to be eaten. I added some fresh pea shoots to perk it up a little. Playing on the Surf and Turf theme- I decided to make scallops as the surf section. To start I made a simple sauce of garlic, sauteed with just a tad of butter, fresh thyme, orange zest, fresh orange juice and then at the end- a splash of Cointreau. I cooked off the alcohol and then put the mix aside. Using the same pan I melted another small pat of butter with orange zest, then I added five big sea scallops to the pan. 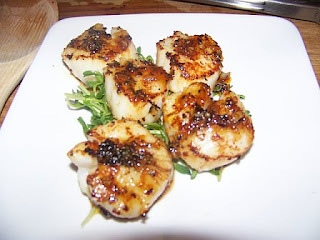 Scallops are great because the cook fast, and they are just so beautiful when they crisp and brown on the top. Within about a minute and a half I pulled the scallops out of the pan and plated them, then into the hot pan I poured back in the sauce that I made earlier. The reheating in the super hot pan cooked it further, and deepened all of the flavors. It was sweet without being too sweet, and had this really nice and round orange flavor from the different additions. The thyme gave it that nice flavor change that you want in a good sauce. Spooned over the scallops it was a really well balanced dish of acidity and sweetness while allowing the flavor of the scallops to still sing their own tune. I have to admit- I dipped everything I ate that night in the sauce it was so good- from steak to peas to bread. 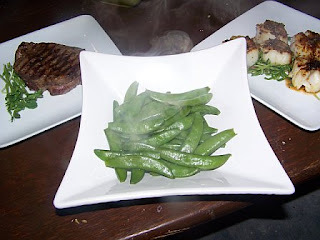 Finally I quickly steamed up some sugar snap peas, a favorite, for a little simple and honest clean vegetation to the meal. Crisp, naturally flavorful, and full of hidden nutrients- these are just a great addition to any meal. 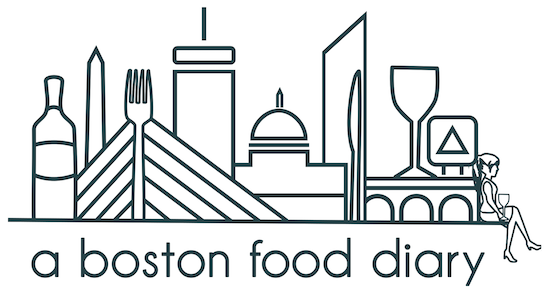 The meal was delicious through and through-full of interesting flavors and simplicity. The scallops stole the show I feel, which was sad for the normal highlight -the Fillet Mignon. I will definitely be inclined to make this meal again, though to save my arteries and my love hate relationship with the gym- Ill make it in pieces paired with some lighter additions. What a delicious tasting menu! I am a sucker for Fettucine Alfredo, too. So simple to make yet so divine. The scallops sound wonderful-love the flavors of the sauce. Premium wines and fine wine merchants providing good red wine, argentinian, chilean, Australian, french, best italian wines. Some of the most expensive wines to order online.